And we’re back again with another interview episode!! Our favorite team, Fanbase Press, is publishing another awesome comic book. 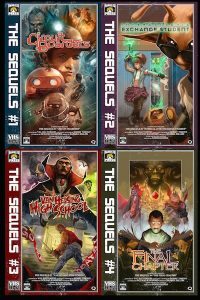 This time we interview the creative team behind, The Sequels!! We spoke with Norm Harper, Val Halvorson, and Bobby Timony! Make sure you pre-order the book from Fanbase Press here!! Make sure you go check out Norm, Val, and Bobby on all their social medias, and lookout for more information about The Sequels!